Over at Whole9, whose normal premise is change your life (diet) in 30 days, threw a curveball at their readers this week. Change your life, yes. How? 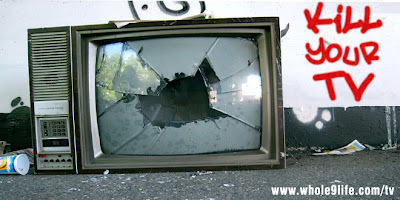 Kill Your TV. From May 1 - 31, the challenge is to avoid television at all costs. Unplug the ones in your home. Ask to sit in a different area of a restaurant if there is one in your section. No movies. No YouTube. No Video Games. Even kill the Tivo -- because if you spend the time you gained in June trying to catch-up on what you missed, you've missed the bus. Kill it all. They recommend making this a household initiative, but that's not going to happen in my house. James shot that down quick -- especially after the Hawks advanced in the NBA playoffs last night. But I'm okay with that. Sure, there's a vacation in there, but maybe I'll see/do more without lounging around the hotel room 'relaxing.' I'm going to miss Makeover week on the Biggest Loser. Date nights will have to change -- since it's usually "Dinner and a Movie." Internet time will be limited to working on my class, blogging, and what I need it for at work. Habit Course. I've managed my habit all week. No significant change in weight, but I'm not surprised by that. At least it's not going up! Good luck! Occasionally, I will have nights where I don't turn the TV on at all (usually I flip it on out of habit). I know I get so much more accomplished without the distraction of the TV. I actually don't watch much tv at all. I'll usually go the entire weekend without turning it on. Now internet, on the other hand, is a completely different story! i couldn't do it, esp while unemployed. i often just have it on in the background, even though i think that's a poor habit. What a great initiative to shoot for. Not sure I could do it though. Although I know in my mind TV is pretty pointless when it comes down to it. Can't wait to hear your thoughts on it all. What a great idea! I read more this weekend and found that I really didn't miss my TV that much.